"One Nation Indivisible" - Chapter One: "Power Struggle"
In the aftermath of the conflict with Doctor Impossible, Hawkgirl surveys the unexplored regions of New Earth 2. The new World Army Cabinet consisting of Commander Sato, Green Lantern, Sandman, Captain Steel and Superman discuss the issues and situations concerning life on the new world. Batman must deal with black marketers as many struggle to have power to feed their families. Everything all seems routine until Hawkgirl finds an opening in a canyon, and the Flash, Huntress and Power Girl battle a beast of unknown origin. Whether these events are connected remains to be seen. Yet, one thing is certain. New Earth 2's heroes have a lot going on in their lives at the moment. Hawkgirl has been attacked by Amazons, a group of women believed to be dead, in a cavern hidden in the canyon she was examining: Meanwhile, Green Lantern has stopped the creature who fought Power Girl's group of heroes. It isn't known if the beast came with the refugees from Earth 2 or if it is the result of terraforming this new planet. Two sovereign states - Erebus and Ark Home - blame the other land for the monster's attack. If talks don't begin soon, a war could break out on New Earth 2. That's something the World Army Cabinet, and everyone else for that matter, cannot afford. 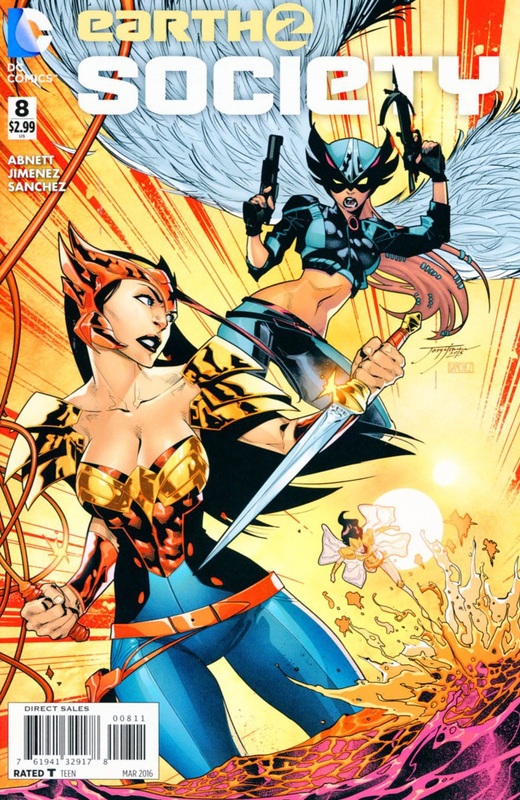 The Amazons have ceased fighting with Hawkgirl on the command of Fury. Now, the winged heroine is welcomed in Amazonia, the cave headquarters of the female warriors. What will Hawkgirl discover now that she is considered a friend? Story - 5: After seven issues that had good moments and bad ones mixed in with a lot of rough patches, this series seems to be heading in the right direction. Dan Abnett's taking over as writer just proves what I've been saying about comics for years. There's really no need to restart a series from #1 when something doesn't work. It's sufficient to change part or all of the creative team as was done in the days before reboots. Forget the previous story arc. This is the true beginning of Earth 2: Society. Dan Abnett gives us a very solid, fast paced story. That's something this book has needed from the start. I loved reading every page of this comic. Previous issues were decent, but flaws stood out that prevented them from being on par with the quality of this one. Abnett never disappoints me as a fan of his work, and he's renewed my hope that this book will be great as long as he remains on it. Dan Abnett has made Earth 2: Society a "must-read". Art - 5: It feels like Jorge Jimenez has really hit his stride with this issue. It's as if the change in writers has allowed him to really explore what he wants to do with this series. If this creative team continues at this rate, DC's really going to have a hit on their hands with Earth 2: Society. Cover Art - 4: The cover itself is wonderfully drawn, and it deserves a top score. However, I knocked one point off because the image feels too much like a spoiler for my tastes.